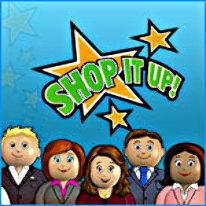 Show 'em who's boss in Shop it Up! It's the grand opening of the new mall, the customers are already inside, but the mall is not ready! Your skills are needed to open and decorate new shops. Boost profits with dazzling inventory displays and fancy advertisements. Once the mall gets busy, hire assistants and cashiers to help with all the customers. As the new boss, you'll need to take advice and meet challenges from the local business leaders. There's great fun in store as you work your way up from the ground floor to becoming the biggest boss in town! Fun is in the bag...play Shop it Up!